"Germans, they have all these rules," my father said as he switched to the faster lane. "One time I saw a foreigner driving slowly on the fast lane, followed by a whole bunch of German cars. None of them thought that they could just pass him on the right. [God forbid] they break the law." We were heading towards a small town called Ingelheim 60 kilometers to the West of Frankfurt, one of many little towns dotted along the lush foothills of the Rhine River Valley and interconnected by a modern highway. Castles appeared almost every few kilometers, standing majestically atop the lush vineyards that boasted some of the best wine in the country. Rheinstein Castle, built in the beginning of the 14th century, was a princely summer residence that offered breathtaking views over the valley. We hiked a good 15 minutes up a steep winding route. The castle had been there so long it felt that it were a part of the land. I imagined the castle, enveloped in green foliage, rising up from the soils like a beast. Upon entering, the grounds were perfectly maintained as if it could still host the most elegant summer gatherings. Flowers were in full bloom and the area immaculately clean. The castle must have been built layer by layer, with corridors and stairways leading us to discover ever more floors, lookouts and rooms higher into the sky. No space was left to waste and every stone felt of immeasurable quality that was built to last centuries. This was the German style, and this culture breathed through every inch of the castle's architectural design and construction. The second stop was a cruise boat along the Rhine. We found a seat near the rear end of the boat and ordered beer (which is actually cheaper than water in Germany). And so we sat there sipping fresh cold beer under the hot sun. Each town we passed seemed similar yet if you looked carefully enough, there was just enough character to distinguish one from another. Ferries that took cars and people across from one side of the river to the other. When parking, you set your own hour of arrival by the honor system. 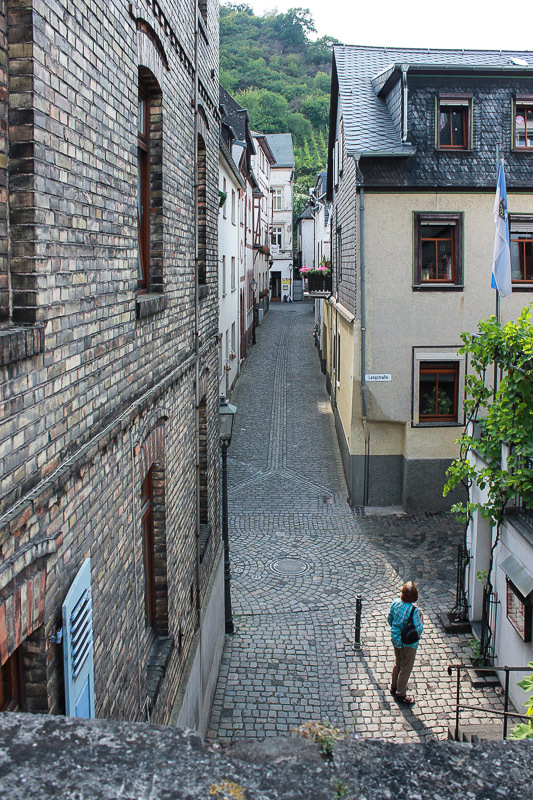 Day two of our trip, we stopped by the more touristy, but still beautiful town of Bacharach. The moment we got off, we saw locals sitting by the river enjoying the sun while parents played with their children in the most elaborate playground I had ever seen, with rock climbing and all kinds of activities. You could tell the playground had been there for a while, but not a single item was broken or rusty. "Everything they do, Germans do it well," my father once said. "They may take three years to build a road, but that road will last a century." My father showed us the dates that were scribed onto the bridge to mark the water levels each year the town was flooded. Instead of treating them as disasters, the Germans embraced it as historical events to be remembered. In 1988, the Hoshwasser flood level was above the height of my father at 1.8 meters. Despite the tourists, we saw many inhabitants going about their daily lives in the small town. We came across a small alley way and saw a girl taking her dog out for a walk. I might have expected her to dress differently or act a certain way, but she seemed just like an ordinary small town girl, going about her life, barely even noticing the existence of tourists. Perhaps we were all just too common. We discovered this gorgeous residence themed with pink and red flowers. Later on, we drove back along the river to Ingelheim where we tasted wine. In this even smaller town, I expected perhaps some disconnect from modern day technology or design. Yet I was about to find out that it was just the opposite. In the courtyard where we sat down for coffee, every stone was laid with precision in a discernible pattern. Instead of candles, solar paneled jars with colored sand lit up the tables. Along the walls were lights built within the ground that would offer spectacular lighting at night. Inside the restaurant, all lights were automatic. Even the receipt we received was printed on stock paper with magazine quality images of the restaurant. "They embrace technology, but they never forget their roots." I now understood why my father loved Germany so much. The combination of technology and history is rare around the world as it is difficult to achieve. In China, the Cultural Revolution destroyed nearly all 5000 years of culture. Today, the young generation in China look to the West for inspiration and find it difficult to embrace the culture so distant in the past. In America, innovation has presided over tradition. A culture of efficiency over quality has favored destroying and building entirely new instead of careful maintenance of the old. In France, quality has succumbed with a mentality of "letting it be", a reliance on past successes, and elitism with pervading ideals that France is still the greatest nation in the world. Though, I do suspect a revolution is brewing. Our last stop was of course, an abandoned castle. Something about the place made it feel grand yet haunted at the same time. Plenty of inclosed corridors offered secret passageways throughout the compound. The castle was entirely self sufficient with farmable land. A well, a dungeon, and plenty of hideouts made me imagine all the possible stories that could have taken place here just a few hundred years ago. "This would make the perfect place for some serious hide and seek," I said. A map of the a self-sufficient castle, drawn for kids.